Once upon a time, writers were people who sat alone in garrets creating their masterpieces. 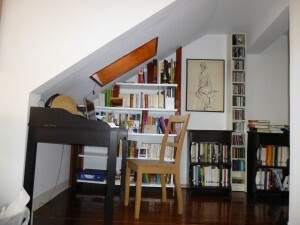 If the world agreed, the lucky writer could move to one of the lower floors with heat in the winter and windows for fresh air. More likely, the writer labored in obscurity, went hungry, contracted tuberculosis, and died. My garret apartment in Lisbon, which didn’t have any heat. While garrets continue to exist, our attitudes toward writers are fast changing, in large part because of a few superstars who’ve successfully navigated the previously separate realms of creation and marketing. A couple of weeks ago I attended an event at the Center for Fiction — now located in Brooklyn — to celebrate the launch of the first four books of the Versify imprint at Houghton Mifflin Harcourt. Before introducing the books and their readers, Versify founder and publisher Kwame Alexander talked about his experience self-publishing poetry in the early 1990s. He got his start self-publishing because in those days traditional publishing was closed to all but a few African-American authors, and the authors themselves did an impressive job of selling their books in creative ways via non-traditional outlets. Alexander bought a cheap used van and with a friend went on a coast-to-coast book tour. In California, his van broke down and he had to sell 150 books — all that remained of his print run — to buy a plane ticket home. He put on a good show that night, the books sold out, and he was able to return home. The Versify panel at the Center for Fiction, from left, Jacqueline Woodson, Kip Wilson, Lamar Giles, Raúl the Third, and Kwame Alexander. Almost 20 years later, Kwame Alexander is an award-winning poet and writer for children for teens. His picture book, The Undefeated, illustrated by Kadir Nelson, has received five starred reviews from the major trade publications and much love from The New York Times and other newspapers as well. The three other books from Versify — Kip Wilson’s YA verse novel White Rose, Lamar Giles’s middle grade contemporary fantasy The Last Last Day of Summer, and Raúl the Third’s picture book Vamos! Let’s Go to the Market — have also garnered wide acclaim. Wilson, Giles, and Raúl the Third were part of the one-week launch tour, which is how I saw them in Brooklyn. 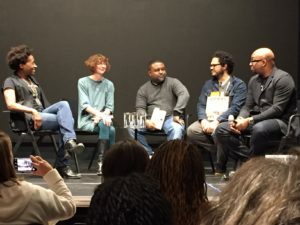 In a panel moderated by Jacqueline Woodson, each of the four read from and talked about their respective books and answered questions from the audience, after which there was a book signing. 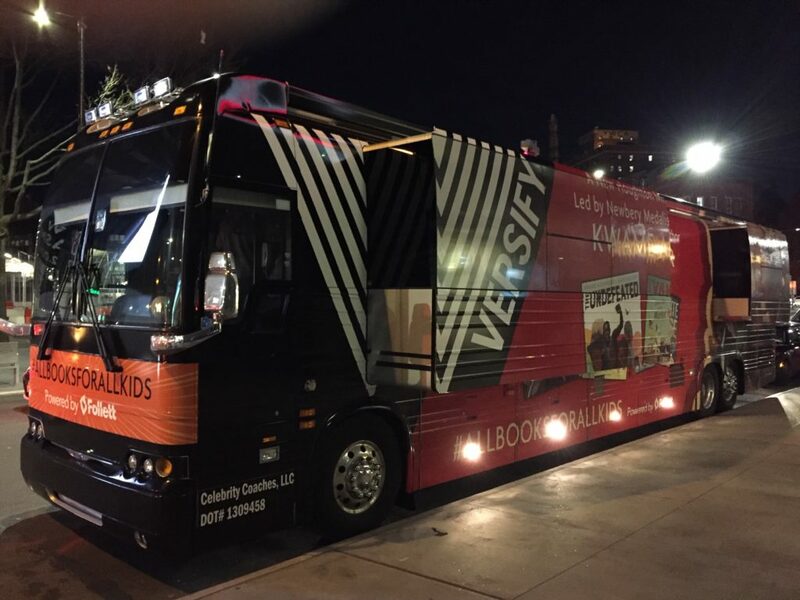 The authors urged those of us in the audience to check out the Versify tour bus, parked outside the Center for Fiction across from the Brooklyn Academy of Music. I’d envisioned the bus as a larger version of Alexander’s van, maybe a reconditioned school bus like the Green Bus made famous in the campaign of Minnesota’s late progressive senator, Paul Wellstone, a hero of mine. The Green Bus made its debut in 1990 and rode through two successful Senate campaigns until October 2002, when Wellstone, his wife, his daughter, three campaign staffers, and two pilots died in a plane crash 11 days before the election. The 1990s and early 2000s feel like another era, a point driven home to me when I saw the bus commissioned for the Versify authors. It was a genuine rock star bus! The 1990s were a time of dressed-down authenticity embodied by Nirvana and other grunge bands. Today, pop stars cultivate a flashier image to garner the attention of fans who have countless more distractions than 20 years ago. And in a winner-take-all society, with its corresponding increase in inequality, being broke is just…broke. The over-the-top bus is dressed to impress. And regardless of what one thinks of these societal changes and their meaning for our culture, Alexander has a sound strategy. His Versify bus is touring the country, going to schools — up to three a day — where children will see that books are just as cool as popular music, that writers are successful and enjoy a life of luxury. (Yes, I can hear the groans of all you writers reading this.) This bus is meant to get attention in a crowded, noisy world. We still need authenticity, but we also need a sprinkle of fairy dust. For kids thinking about their future, the bus is like the field trip to Brown University that my daughter took with her fifth grade class last week. It’s a dream, a fantasy shown to kids, but one that may spark a lifelong quest. Dream big, the bus tells kids. Reading is cool. Books take you anywhere you want to go, and the world you can move within just expanded a whole lot more. 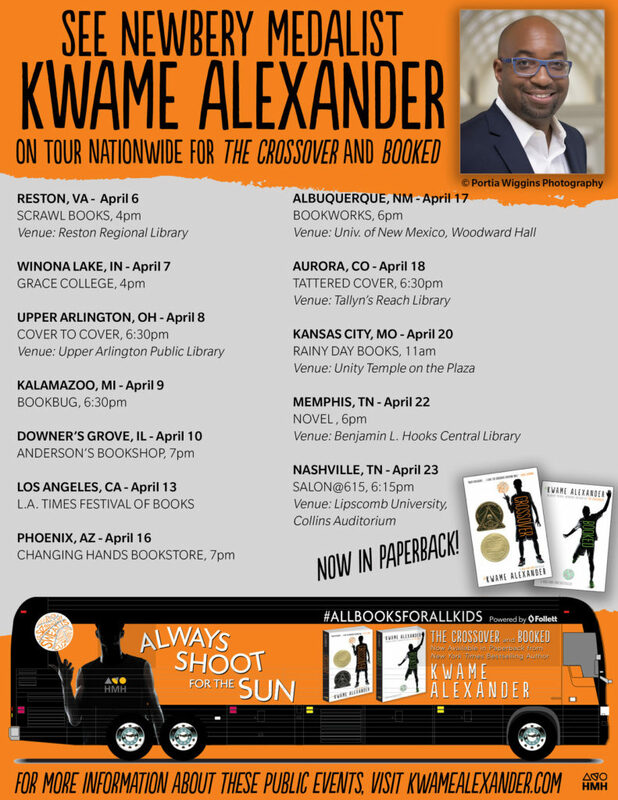 Although the Versify tour has ended, Alexander is still on the bus with paperback editions of his bestselling verse novels The Crossover and Booked, joined by musician Randy Preston. Wow! All these rock stars in one place! I’m not an envious person by nature, but, just WOW! Thank you, Lyn, for this excellent (as usual) blog post. I was so tempted to stow away on the bus! I also wish I could sneak onto that tour bus! Kwame is such a giving author! After writing this piece, I spent way too much time googling interiors of rock star buses. I also found some cool conversions of short school buses, so I think that’s going to be my goal: the short bus.